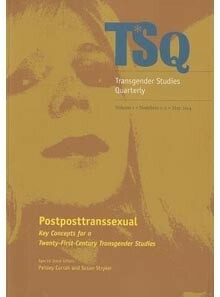 "TSQ" aims to be the journal of record for the rapidly emerging field of transgender studies. 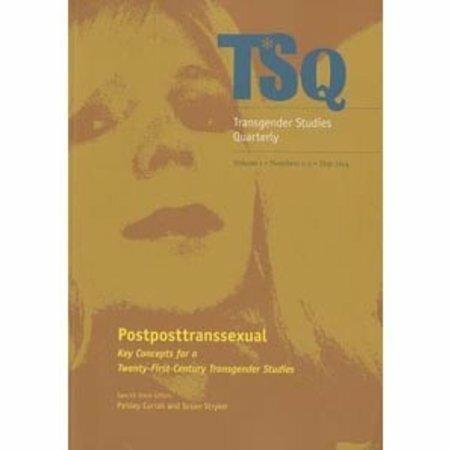 The inaugural issue, "Postposttranssexual: Key Concepts for a 21st-Century Transgender Studies," pays homage to Sandy Stone's field-defining "Posttranssexual Manifesto" and assesses where the field is now and where it seems to be heading. Comprising over eighty short essays by authors ranging from graduate students to senior scholars, the issue takes on such topics as biopolitics, disability, political economy, childhood, trans-of-color critique, area studies, translation, pathologization, the state, and animal studies. Some keyword entries resemble encyclopedia articles (sports, psychoanalysis); others are poetic meditations on concepts (capacity, transition); still others offer whimsical and eccentric expositions of words that are more unexpected-and unexpectedly productive (perfume, hips). Some entries pose trenchant resistances to the keyword concept itself. The issue includes a substantive introduction by the editors and serves as a primer for readers encountering transgender studies for the first time.